One of my favorite US newspapers, the Sacramento Bee, just published a nice article about LDS diversity in Sacramento. "Mormon church a widely diverse entity in Sacramento region" mentions several different groups of Latter-day Saints in the Sacramento region, including the Hmong people. Appleton, Wisconsin, where I lived for about 20 years, is a small town with a surprisingly high Hmong population, around 4 or 5%. On my first Sunday in Appleton when we moved there for the second time in 1994, I remember being surprised by all the Asian people sitting behind me near the back of the church, speaking what sounded like Chinese but wasn't. I had taken a few classes of Chinese way back at BYU and strained to catch a few recognizable words, but it was definitely a different language. I would soon learn that they were immigrants from Laos who had paid a terrible price for supporting the United States during the Vietnam War. It's a long story, one I try to tell on my webpage about the Hmong people, but there is much more drama and trauma than I could ever capture. 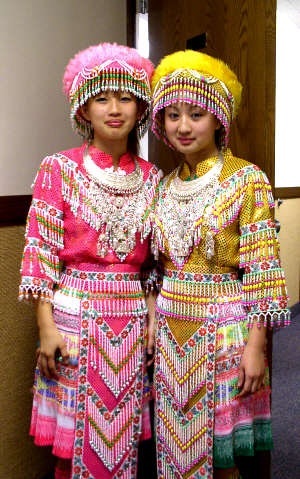 Two Hmong sisters at a cultural event in the Appleton, Wisconsin Stake Center. Every Hmong family I know has stories to tell of fleeing for their lives and losing nearly everything. This includes fleeing through a dangerous jungle, evading vicious soldiers, swimming across a hostile river patrolled with enemy forces, losing loved ones along the way, sometimes being separated for years from family members, and suffering deprivation and neglect in refugee camps. They faced genocide for their part in supporting the United States. Sadly, many Americans had no idea why the U.S. government allowed many to come over here (partial repayment for their valiant service and a recognition of the mess we had created). We got them to fight for us in the secret wars of Laos with the promise that we would never abandon them. We armed their boys and trained fighter pilots. Those pilots would fly mission after mission until they were shot down, nearly 100% casualties. When our pilots were shot down over the jungles, Hmong soldiers waged valiant rescue missions to reach them before the enemy did and bring them back alive. Many U.S. pilots owe their lives to the Hmong. In some cases, more than 100 Hmong men would lose their lives in a rescue mission to bring back a single U.S. soldier. The Hmong people are tough, gutsy, freedom-loving, and truly beautiful. Because the campaign in Laos was secret and contrary to our official news, they were not given public recognition for their valor. They were the best allies the U.S. ever had. Then, without warning, we packed up and left, leaving the poorly prepared mountain people exposed to the full wrath of an angry enemy. My first calling when we returned to Appleton was to work with minorities in the stake, including the Hmong people. This began a journey that would bless my life in many ways. Later a Hmong-speaking branch would be formed in Appleton and my family would serve in it. I was first counselor to a Hmong Branch president, a good, loving man. There were many challenges for Hmong Mormons, and some good people would leave the Church when Hmong culture and the Gospel clashed just a little too harshly. My time with that branch was wonderful, but there were also some messy, traumatic, terrible moments, including one of the most painful episodes of my life, where I have a desire to go back in time and try things differently to see if a better solution could have been found. The Hmong Mormons of Wisconsin, California, and many other places are remarkable Latter-day Saints. If you know any, tell them "Ua tsaug!" from me (that means thank you, pronounced like "waw jiao" with a breathy, falling tone on the "jiao"). If you have a chance to serve them as a missionary, you are a blessed and lucky creature. If you have a chance to serve with them, be prepared to work hard and grow quickly. They are a beautiful and vibrant part of the remarkably diverse LDS community, and I'm glad the Sacramento Bee recognized this.